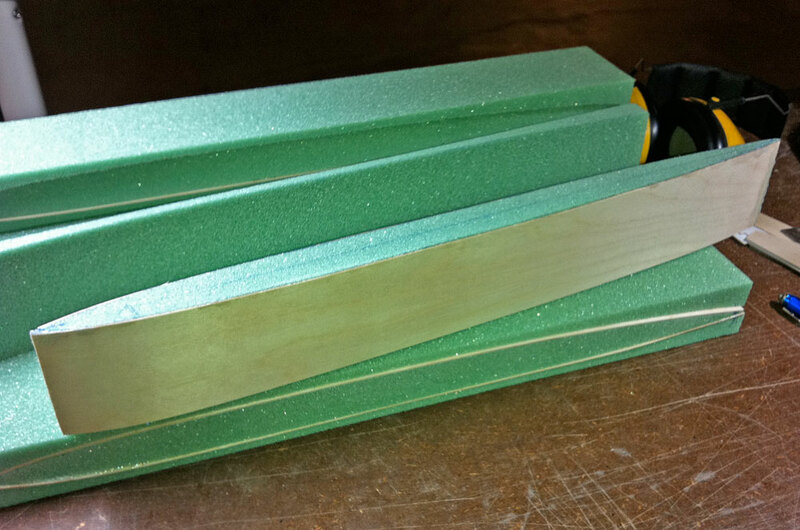 Some have suggested that you could use balsa wood as core material, and yes, you could. But there are some things you should know before using that. 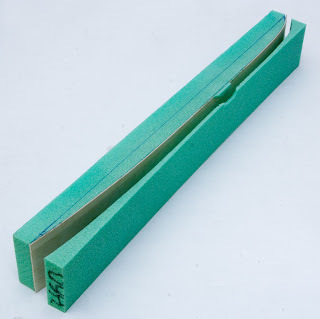 Firstly, balsa soaks moisture like nothing else... And because it's a boat that means water of course! You might think that painting them will seal them for good but that is hardly the case. If you race your boat you will most likely get in contact with other boats and stuff and that could brake the "skin" so to speak and the water soaking could start well before you even have noticed it. Then the laminating epoxy you will use to seal the wood is most likely not water resistant either. The product we use for that is the C+C chemical resistant one from R&G that also is said to be water resistant and it has worked awesome for us. 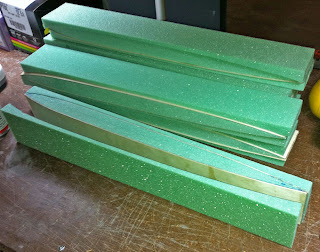 Anecdote: I have a German friend that bought a rigger from the US that had balsa cored sponsons. The boat worked good right out of the box and my friend used it like that for a while. Then it started behaving strangely and he couldn't figure out what the problem was until he noticed it was heavier on one side. He removed the sponsons and one of them was much heavier then the other! He put them in the water boiler heating room in his house for it to dry out and he measured the weight every day. If I remember it correctly it took a couple of weeks for the moisture soaked sponson to get down to the same weight as the other. After that he re-painted the boat and it ran good again... With a correctly built Divinycell H60 cored sponson that would hardly happen. First you need to sand the top and bottom part of the foam cores flat and true. 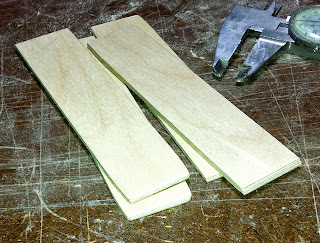 The bottom part is most important to be 90 deg as that is facing down when using the band saw to cut them out. After that use a pen and a straight edge and mark the centerline on the top part of the sponson cores. 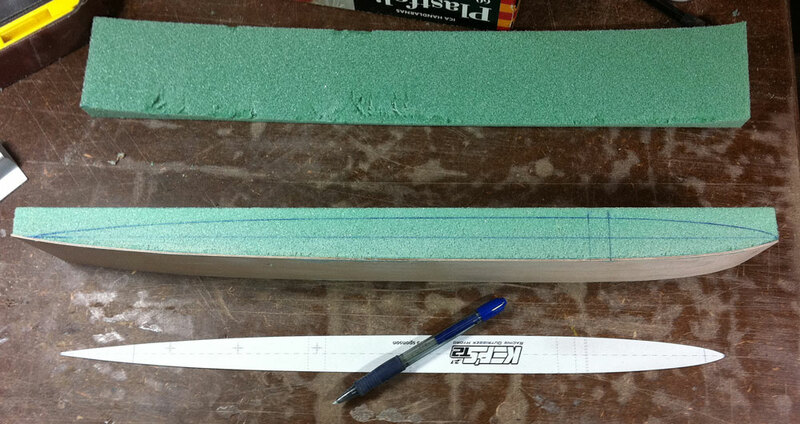 Then use your top-view sponson template and mark one half of the sponson outline. 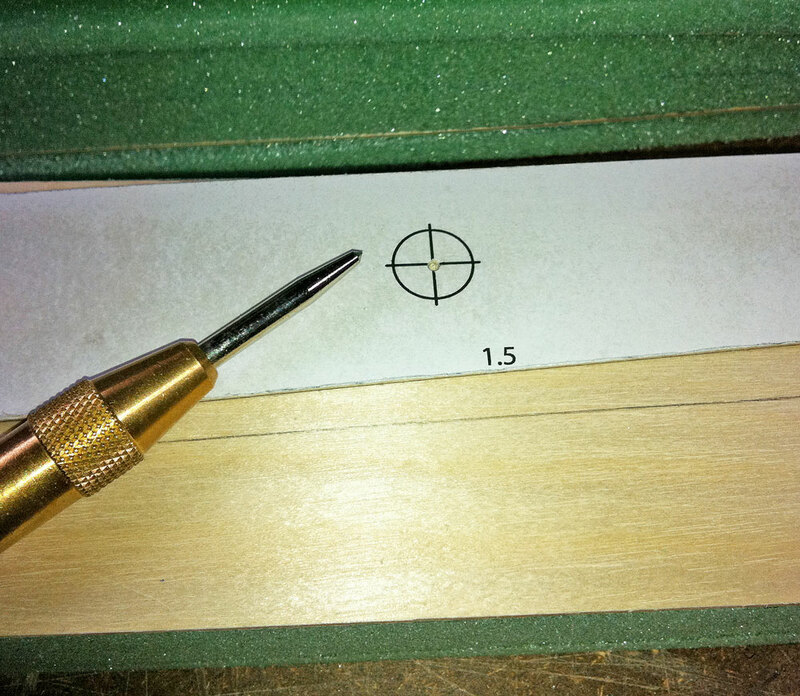 Use the centerline to align it. 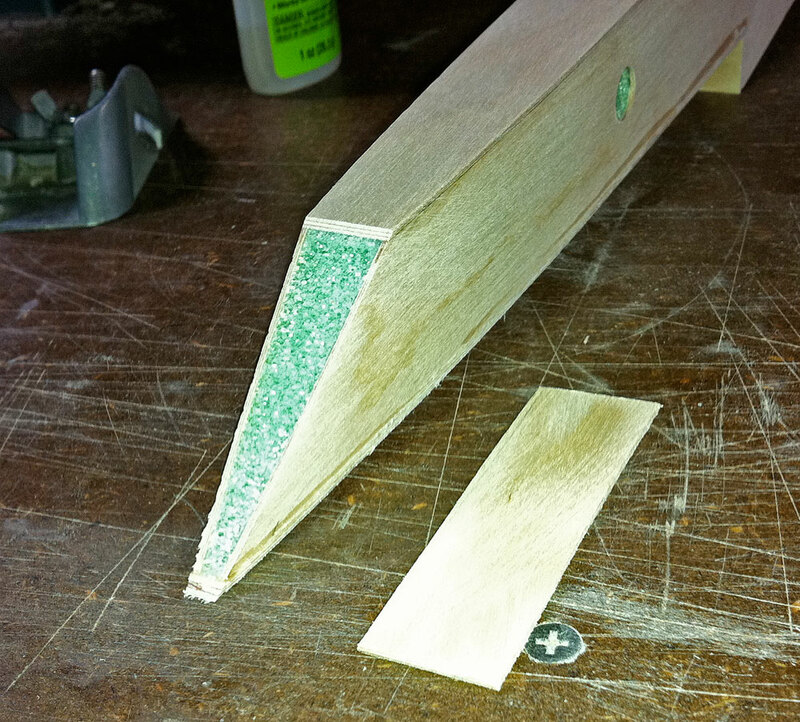 Before you start sawing make sure that the blade and the base-board are at 90 deg! 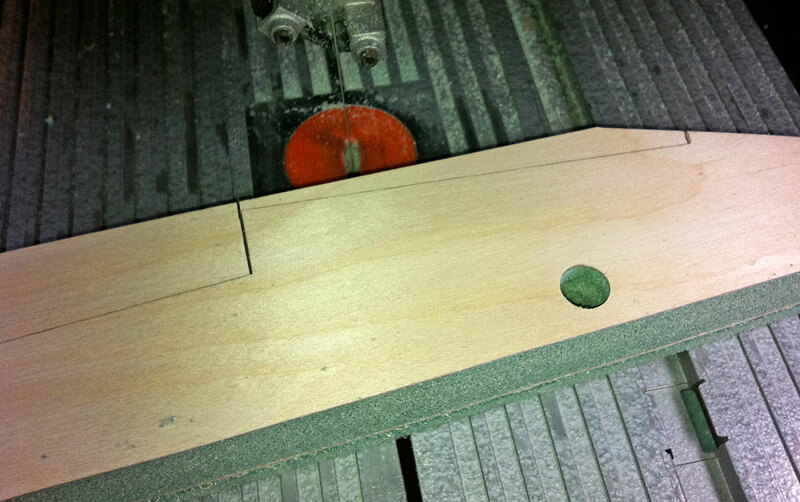 Then start sawing the sponson shape out. Take your time and go slow. Look at what you are doing. 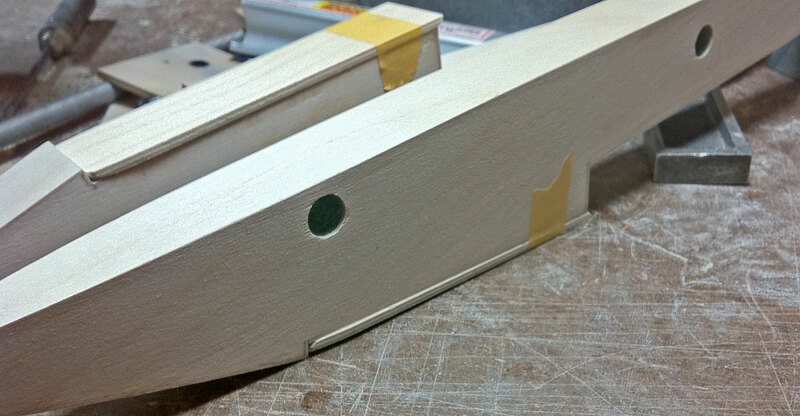 I saw just about in the center line of the marked out pen-line as that saves sanding. But depending on how good you are and how careful you where when making sure that the sawing board and blade was at 90 deg you might saw a little outside the line... Here is a recommendation also: extend the rearward elliptical shape to a point so to speak. That will be sawed off later on but it's good that it's extended at its max at this stage. Also to the front part of the ellipse I don't saw it exactly as the template as that would make it hard to cover with plywood. I flare it out slightly so it becomes a little pointy. That will also be sawed off later on and the nose-block will be sanded round. When one half of the top-view shape is sawed out. 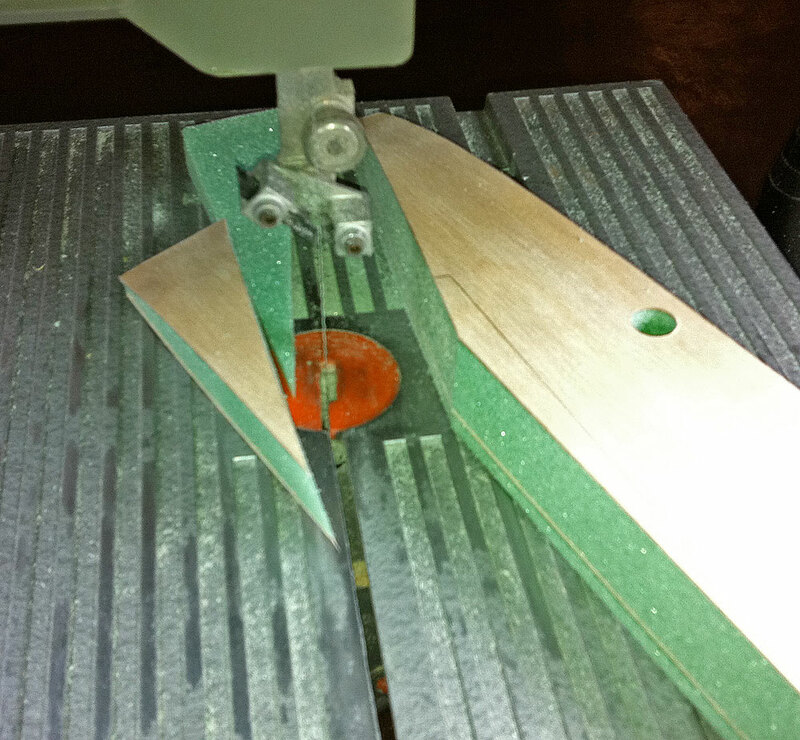 Sand it smooth and check that the saw-out is straight and true (90 deg vs the bottom). Sand it smooth and make the side 90 deg vs the bottom. Blow away the sand dust. 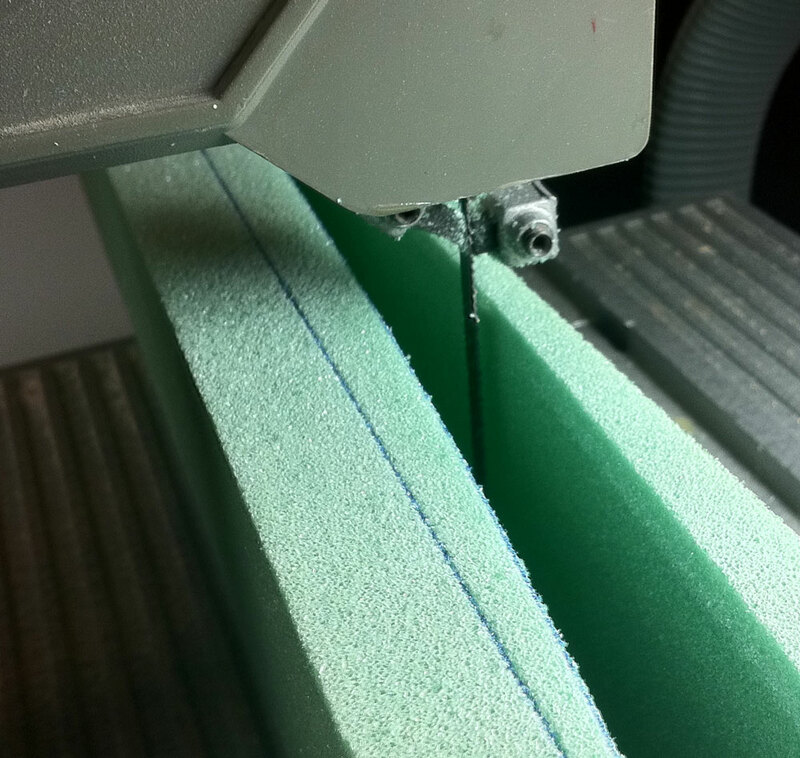 Cut-out a 1 mm plywood sheet that has the same dimensions as the H60 core. Sand it slightly. 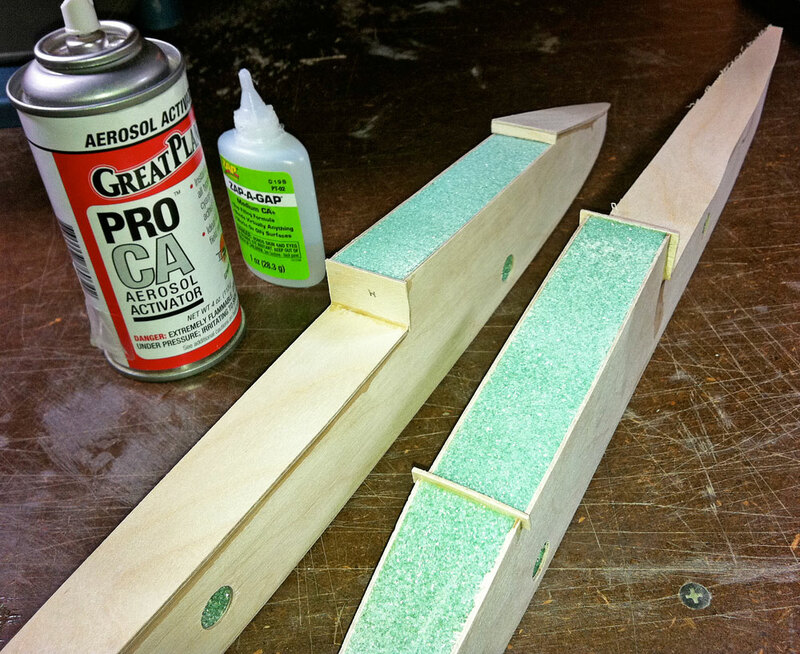 Spray CA glue activator/kicker on the complete surface of the plywood to be glued to the Divinycell H60 core and place it on top of the concave cut-off part of the foam core. 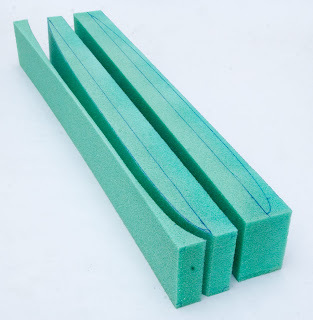 DON'T use kicker on the foam! Note, you must use a fan that is quite close to your glue-station set to max! You wont be able to breath when the kicker starts to react other wise and your eyes will water up instantly. Trust me. Been there, done that. It's not fun when you forget to start the fan! 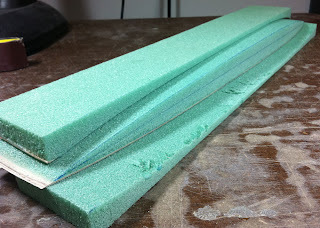 It's also good advice to cover your build table with thin food wrap plastic at this time. Also use suitable build-clothes and throw-away protective gloves. As you can see, it will pour out some glue on the outside of the plywood also but that can be sanded off. But if it's close to the edge it will actually be sawed away. 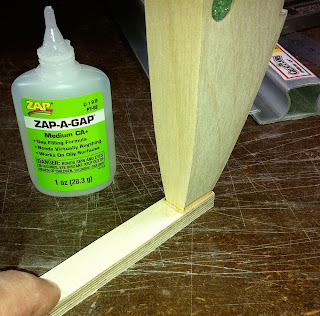 Trim the excess glue and protruding plywood away and sand the top and bottom parts flush again. 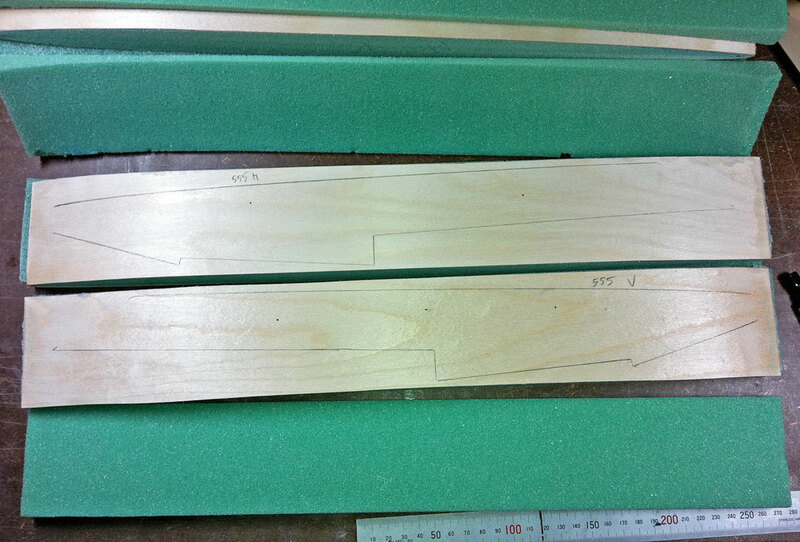 The bottom part again is the most important to get back to 90 deg. 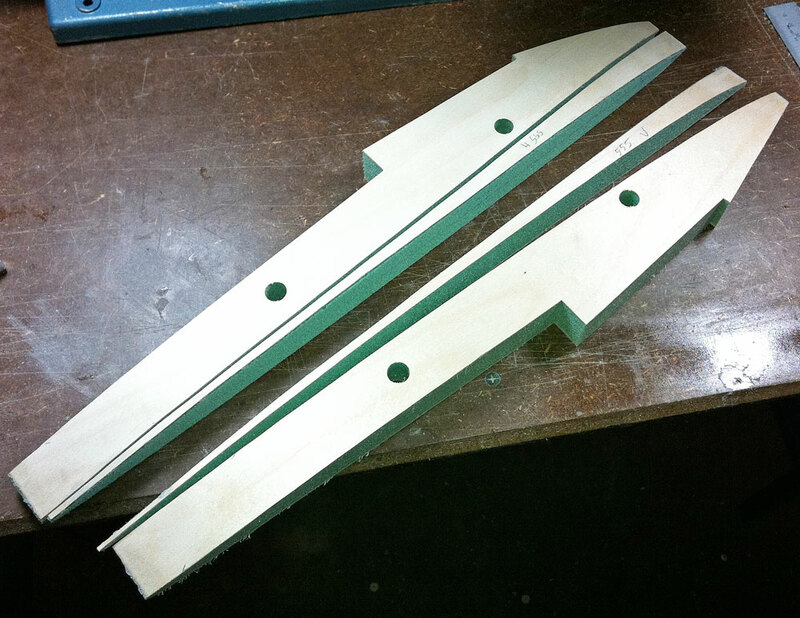 Use the top-view sponson template again and use the recently planked side as guide and reference for marking out the other side... Use the band saw and saw out that part as carefully as possible. 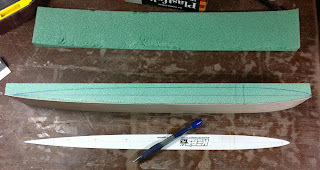 Note that I have marked out where the front sponson tube will be approximately. 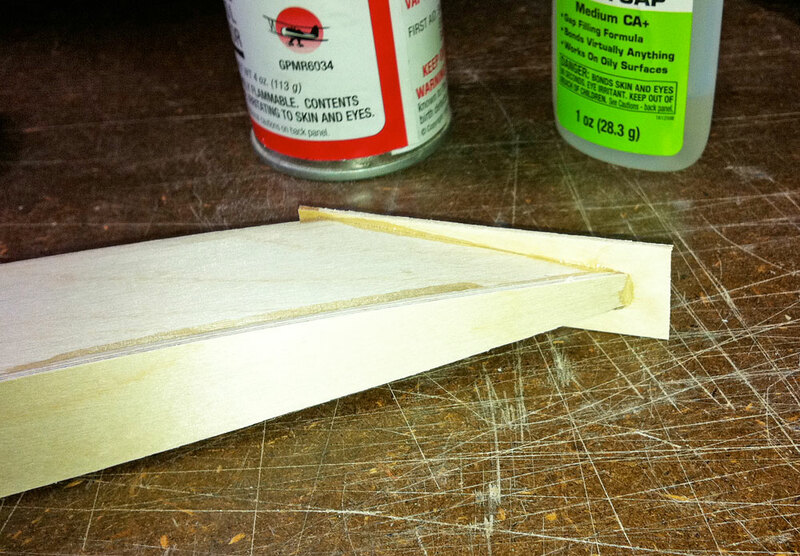 That will be used when the side view template needs to be aligned to make the side profile. 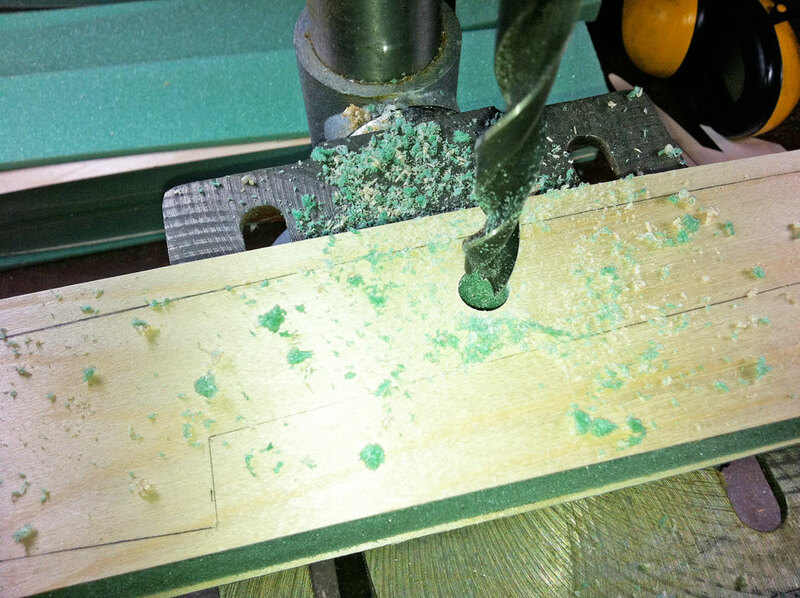 Repeat the skinning of the other side of the sponsons in the same manner as earlier. 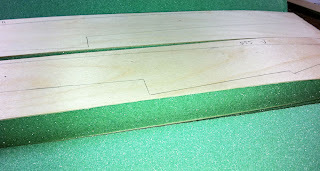 Use the side view sponson template and use the front sponson tube marking you did earlier and mark out with a sharp pen the outline and the center of the sponson tube holes. 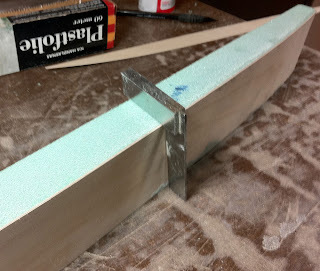 Make sure that the template is put on the sides so the center of the sponson tubes are horizontal so to speak - meaning they are at an equal length from the bottom and not at an tilted angle. 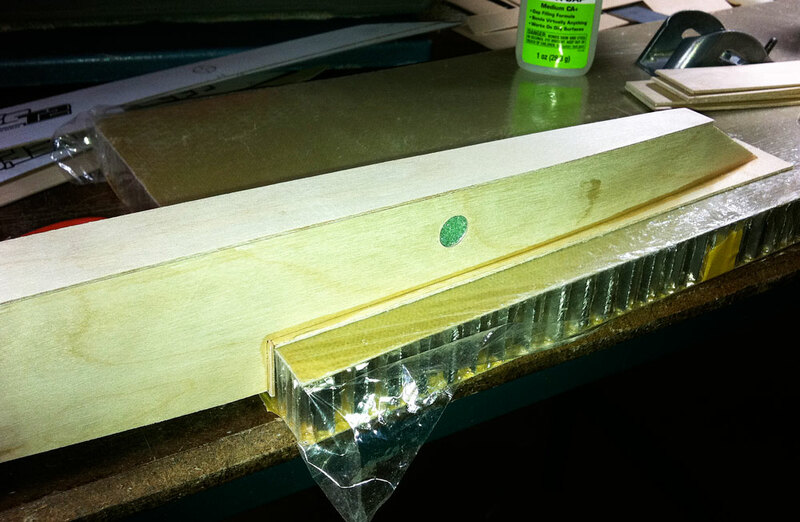 Use the outside concave sawed-off waste H60 material as a drill jig base. View the sponson from the side and make sure it's centerline is aligned horisontal. Use a drill press and drill the sponson tube holes with a brad point drill bit. In my case that is 12 mm in diameter as I use a 10x12 mm aluminium tube here. 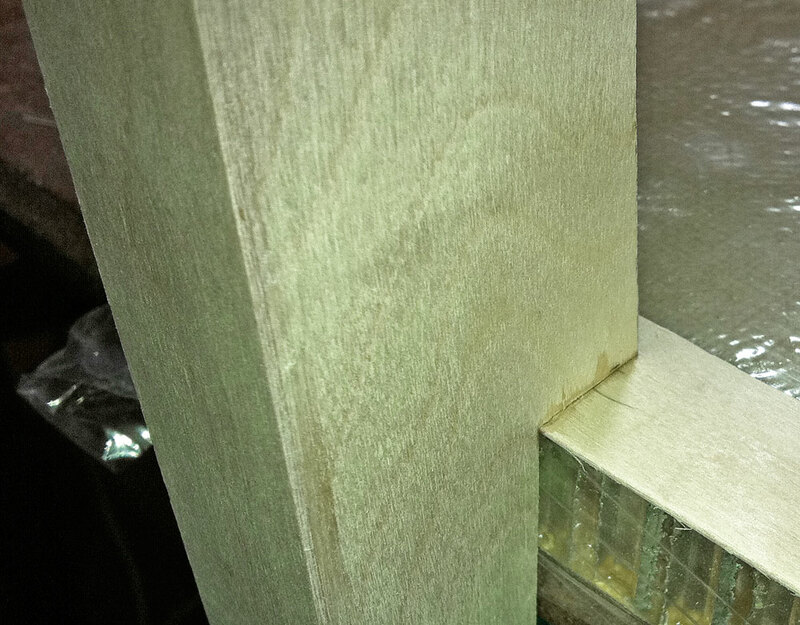 Be careful when you start to drill through on the outside as it's easy to have the outside plywood to tear-up. Go slow @ exit. Use the sawed-away concave waste H60 material as a jig again so the sponson is lied down horizontally. 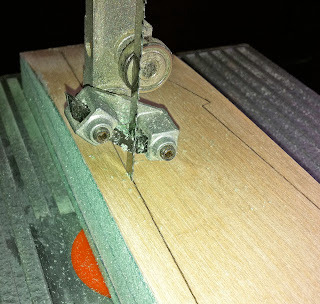 Use the band saw and carefully saw out the side profile of the sponsons. 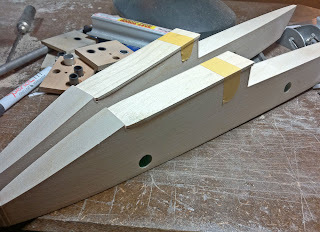 Saw all side-view parts out except the nose and trailing edge at this point. I try and saw right in the middle of the line as the sanding will be faster/easier. Use a straight/flat sanding bar and 80-grit paper and sand the top deck smooth. Make sure that its at 90 deg to the sides. When you are satisfied with your sanding blow away the sanding dust. 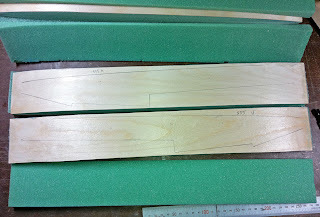 Cut out a piece of 1 mm plywood for the deck. Sand that slightly. 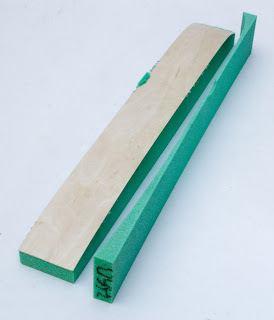 Spray the plywood with kicker. Sand the rear step-roof flat and at a 90 deg angle vs the sides and repeat the skinning process as earlier. 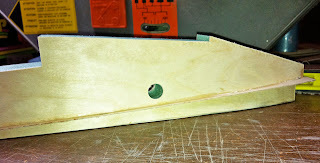 Here it should be 1.5 mm plywood (turn-fin mount), at least for the right-hand side sponson. 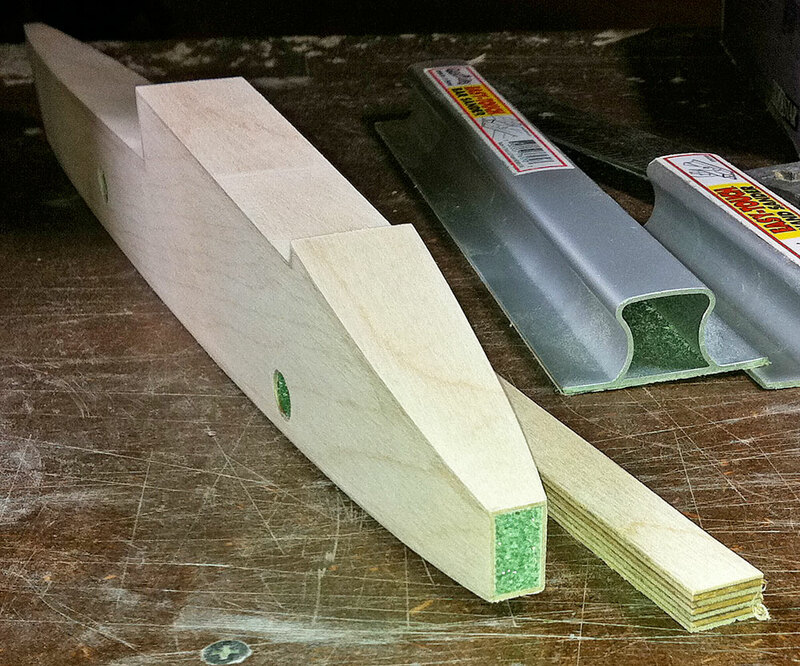 On the left you can use 1 mm plywood. 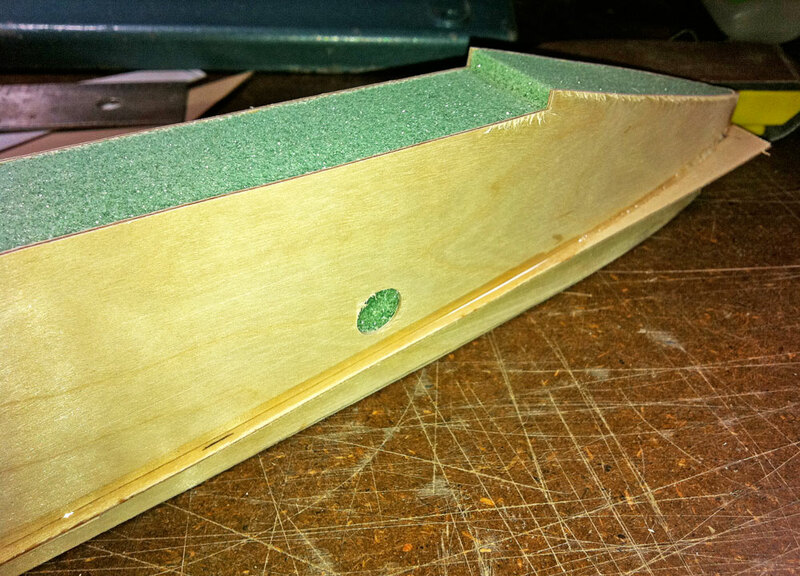 Sand booth front surfaces flat and true. Start gluing the front bottom... 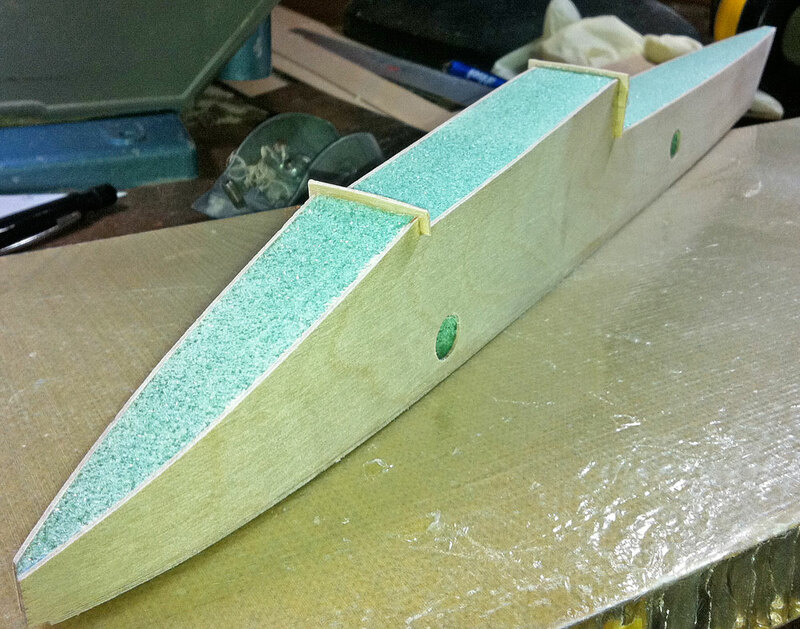 Trim off excess material and then do the ride-pad mounting surface... That absolutely needs to be flat and true to get good performance! 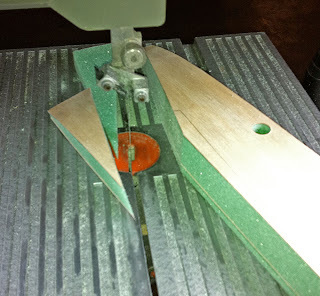 Use the band saw to cut-off the nose and sand it flat. 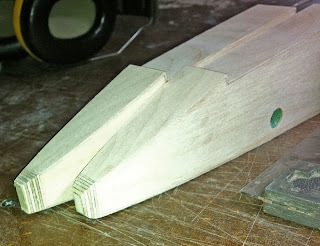 I use a thicker plywood as a nose block. Use kicker on the plywood as usual. 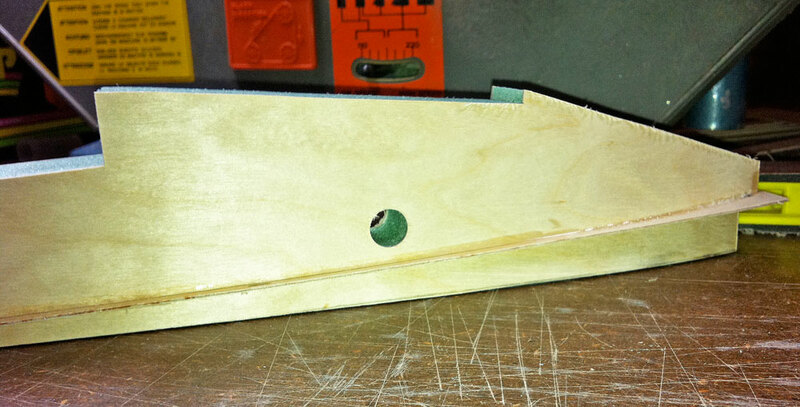 Add glue on the sponson and press down on the earlier "kicked" plywood nose block. 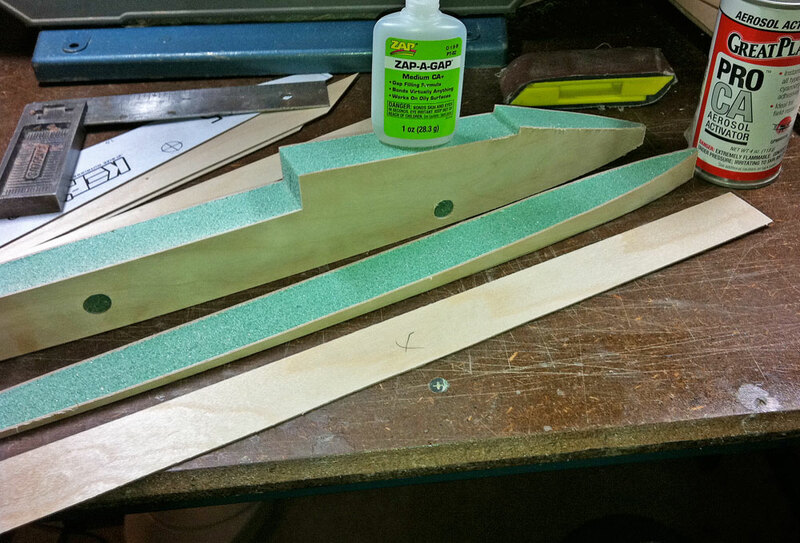 Now it's time to sand the complete sponson! 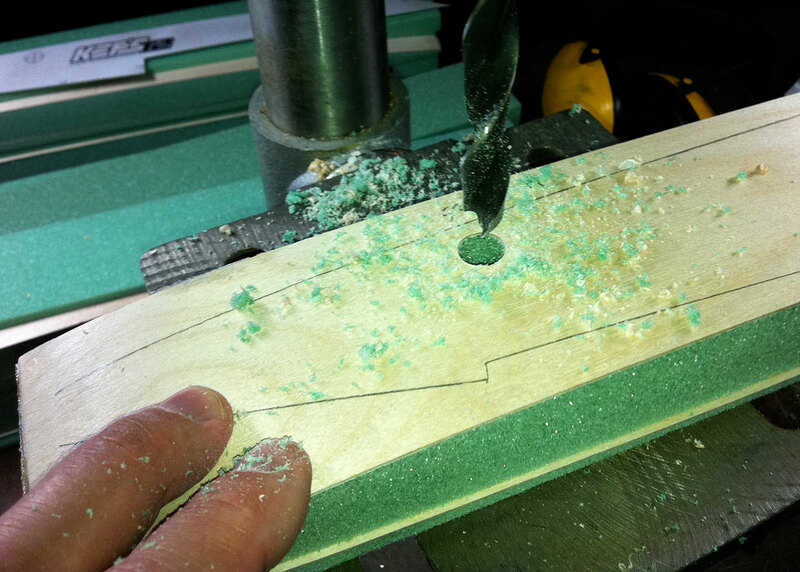 That starts with sanding the nose-block flush with the sides and then start sanding the curved part of the nose. After that you can do the complete sponson. Make sure that the parts closest to the water has a bit more sharp corners. At least the front rear step that you can see in this picture above. See your print-out copy of the main drawings as reference for making the plywood ride pads. The edges need to be straight and true and the downwards edges need to be "sharp". 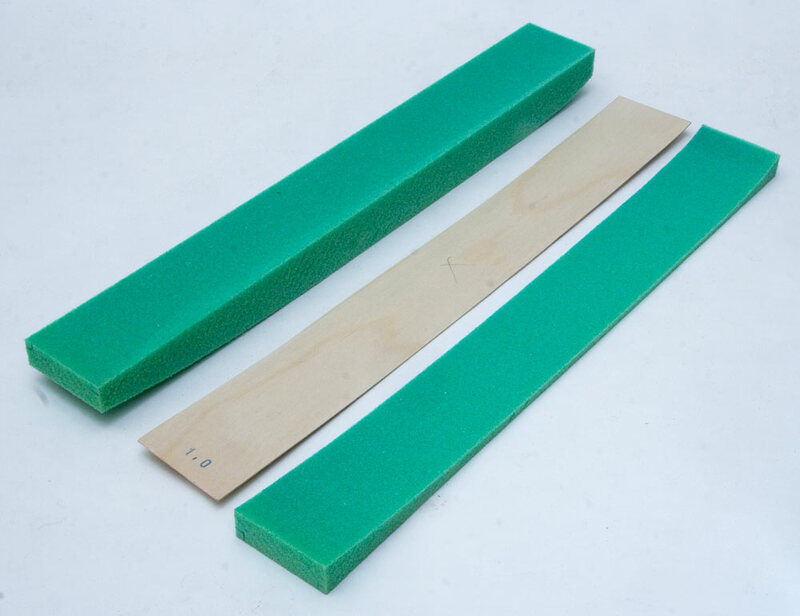 At this time you can make a few alternative ride-pads in different thickness - like 2 / 2.5 / 3 mm. Depending of how accurate you have been in your build and how thick your double sided tape is, you could need to alter the AoA of the boat with different thickness ride-pads. I doubt you will need thicker then what is specified in the drawings though (3 mm thick). Note, no-one can be 100% accurate when building a wood outrigger. There will always be some differences even when I build them and that can make each boat slightly different of course. Ride-pads in their place. Not to be fastened with masking tape though. 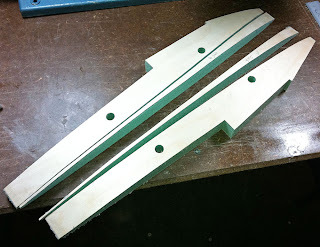 When painted and done I use 0.7 mm thin double sided tape to hold them in place.